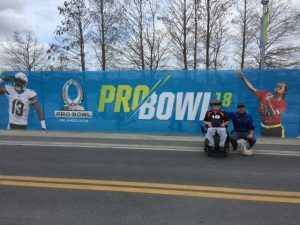 After a week off last week, my dad got back in action this week and made his way to Orlando to make wishes come true in the front row at the 2018 Pro Bowl! However, the weekend certainly did not start out as planned. I dropped my dad off at the airport at 5:45am Saturday morning. He was scheduled to be in Orlando by noon. Unfortunately, a mechanical malfunction delayed the flight almost 8 hours! The flight eventually took off around 2:00pm and he finally arrived in Orlando around 6pm. Today we were honored to be hosting Army Veterans Steve Kirk & Corey Lehman. Steve had originally planned to bring his grand daughter & stepson, but unfortunately his grand daughter got sick and was unable to make it. So my dad reached out to SGT Lehman could make the game. And in his wife’s own words – “He is freaking ecstatic right now and can’t find words. He would love to attend! Where does he need to be and when” Needless to say he was excited for the opportunity. 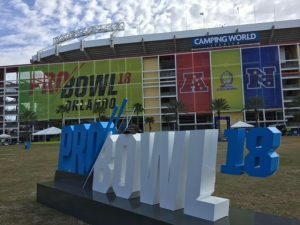 My arrived at the Camping World stadium early to explore the festivities surrounding the area. He snapped a few pictures while he waited for the warriors to arrive. Thankfully the rain had held off so far… Steve was first to arrive. They got to know each other a little bit before my dad escorted Steve inside to his front row seat. My dad waited outside for Corey, who was on his way. 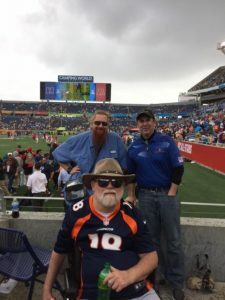 Corey was our guest a few years ago at a buccaneers game. 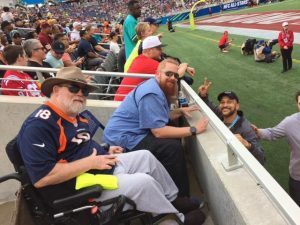 My dad really enjoyed catching up with Corey as they too made their way to the front row to watch the NFL’s best players kick things off at the 2018 Pro Bowl! Although the warriors had hoped for a little more action in their end zone, but they were clearly entertained the entire game by the cheerleaders, mascots and a few special guests during the entire game. 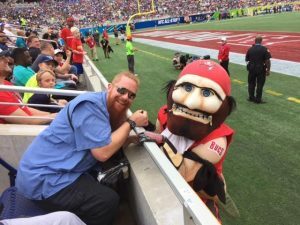 The Bucs mascot even stopped by to take a picture! Keegan Michael Key from the show “Key & Peele & the Air Force pilots who did the pregame flyover also stopped by and thanked the warriors for their service. Steve, an avid Broncos fan was excited to meet “Rescue Rob,” a fellow Denver Broncos SuperFan Who has a Broncos fire truck and dresses in Broncos fire gear to all the games. In between all the action, the rain began to fall & down poured at times. 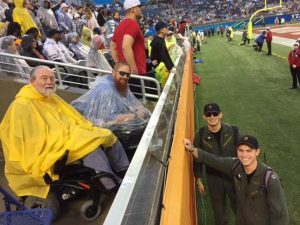 These army veterans were not going to let a little rain quinn their day. They put on their ponchos and stuck it out until the end to see the AFC comeback in a last minute win over the NFC. Overall, a great time was had by all. After the game, Corey’s wife Sent my dad a very nice message telling him how much today’s game meant to Corey. It’s always humbling getting those messages, because the experience was equally as special to us as it was to Corey. 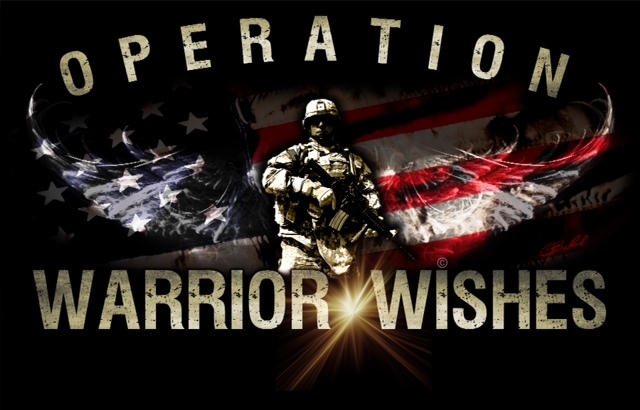 We don’t make warrior wishes come true for recognition, & we get paid in nothing but smiles. Having the opportunity to host warriors like Steve & Corey is a true honor. We want them and all the warriors who have selflessly served our country to know that they are appreciated. 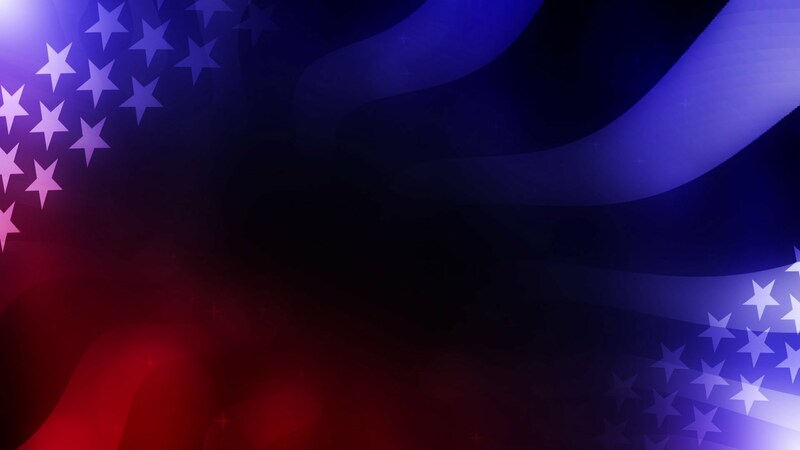 Their service and sacrifices have not gone unnoticed & they will never be forgotten. There is no better feeling than seeing a smile on a warriors face! 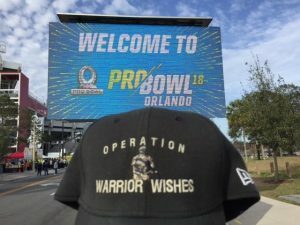 Operation Warrior Wishes would like to thank Army Veterans Steve Kirk and Corey Lehman for the opportunity to host them at this year’s Pro Bowl! Tomorrow, My dad will be leaving the 80 degree temperatures of Florida & head up north to Minnesota where it’s currently -2! 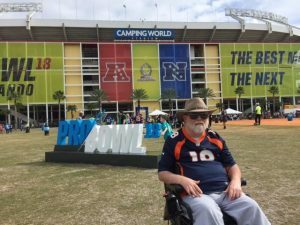 He will be spending the entire week in Minneapolis making Warrior Wishes come true at various Super Bowl events leading up to the big game next Sunday! 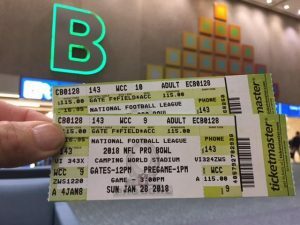 Stay tuned to meet the 4 warriors attending Super Bowl LII!